Prof RB Singh, president of the National Academy of Agricultural Sciences, today exhorted farmers to ensure at least a 6 per cent annual growth in livestock to reduce poverty and attain a 4 per cent growth in the GDP. The president of the National Academy of Agricultural Sciences and former member of the National Commission for Farmers, Prof RB Singh, has strongly pleaded for setting up an “independent” commission for farmers for improving their socio-economic status. The hitherto backward and neglected Mewat area will soon get a facelift with an all-around development. While the Rs 678-crore medical college here is nearing completion, the district will also have a canal constructed at a cost of Rs 640 crore, a college for women, government polytechnics, ITIs, development of Kotla lake, 49 new health sub-centres and six new primary health centres. The Haryana government will regularise over 1,000 illegal colonies in the urban areas of the state soon. A study centre of IGNOU and a full-fledged library room were today inaugurated by Justice Ajay Kumar Mittal, judge of the Punjab and Haryana High Court and administrative head of Faridabad Sessions Division, in district Jail in Neemka, near here. In his address at the ninth annual convocation of the National Dairy Research Institute (NDRI), Professor Singh said agriculture accounted for 17 per cent of the national GDP, over 50 per cent of the overall employment and over 70 per cent of the Indian rural workforce but one-fourth of the world’s hungry and the poor lived in India and 40 per cent of the undernourished children were Indians. “Livestock growth reduces poverty and provides more job opportunities for women and for achieving a growth rate of 9 per cent GDP during the 11th Plan, the agriculture GDP must attain an overall growth rate of 4 per cent and the livestock sector must grow annually by 6 per cent. Ashok Sinha, Secretary, Union Ministry of Food Processing Industries, emphasised the need for a shift from a population-driven to a technology-driven livestock sector in the country. Thirty per cent of India’s farm produce was wasted due to inadequate post-harvest storage and processing facilities and focus should be on developing nutrient-dense high shelf life, fortified foods and ready-to-eat mixes, he said. Dr AK Srivastava, Director of the institute, said the NDRI was again on the world map with the birth of ‘Garima-II’, cloned buffalo calf from embryonic stem cell and ‘Shrestha’, cloned buffalo calf produced from ear somatic cells using the hand-guided cloning technique. Recent research at the institute had resulted in the production of herbal ghee, fibre rich dairy foods and acido-bifidus probiotic dahi. 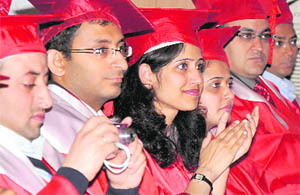 A total of 19 BTech, 81 Master’s and 32 doctoral degrees were awarded. The Director’s gold medal was awarded to Geetika Thakur, Yathis HM, Ata-Ul-Munim Tak and Nisha Saini for securing the highest OGP. The best PhD thesis award was earned by Raj Kumar Duary, Yajuvender Singh and KB Vedamurthy. A documentary “NDRI at a glance” was also released on the occasion. He stressed the need for ensuring remunerative returns to the farmers. “Farmers must get a competitive edge by having access to modern farming and post-harvesting and marketing techniques,” he added. Announcements to this effect were made by Haryana Chief Minister Bhupinder Singh Hooda while addressing a massive “Nav-Nirmaan” rally organised by local MLA Aftab Ahmed here today. Admitting that the Mewat area had not received due attention during the previous regimes in the state, Hooda asserted that he, along with Ahmed, would leave no stone unturned in removing the stigma of backwardness from the face of Mewat. The Chief Minister maintained that the Nuh-Palwal road would be made a state highway, the upcoming medical college named after Shaheed Hasan Khan Mewati and PG courses started at Nagina and Tawdu colleges. Hooda announced a sum of Rs 5 crore for various developmental works in the villages of the district and Rs 2 crore for the local municipal body. Responding to another demand put forward by the local MLA, the CM conceded that construction/repair of roads in Haryana was being hit due to ban on mining in the state. He accepted the demand for urging the Central authorities to lift the ban. Upbeat over the massive turnout at the rally, Hooda not only accepted most of the demands made by Ahmed, but also appealed to the people to support their MLA as he was their “true well-wisher”. Aftab Ahmed’s father and prominent Mewat leader Chaudhary Khurshid Ahmed, who was also present on the occasion, thanked the CM for developing Mewat “ as never before”, and expressed hope that the Hooda regime would make a hat-trick by coming to power for the third successive term. Other speakers, mainly Haryana Congress working president Kuldeep Sharma, launched a scathing attack on former Chief Minister and INLD leader Om Prakash Chautala accusing him of misleading the people. “The INLD leadership has not sought Governor’s permission to prosecute Chief Minister Hooda as they had been claiming publicly?. This shows how double-faced they are,” asserted Sharma. For a change, Hooda, too, termed Chautala as “the most corrupt Chief Minister the state had ever seen”. Announcing this here today, Gopal Kanda, Minister of State for Urban Local Bodies, said 43 illegal colonies of Sirsa town had also been included in the list of the colonies to be regularised. He said the government had decided to regularise all illegal colonies in different towns of the state for which proposals had been received by the department. Kanda said the government had decided to expand the peripheries of municipal areas in various towns and cities of Haryana. He said the government was in the process of exploring possibilities of increasing the revenue of municipal bodies in the state. He said a meeting of officers of the department had been called next week to discuss all these issues. Kanda said the e-tendering system was being introduced in Haryana for all kinds of development works in municipal committees, councils and nagar nigams to bring about transparency. The minister said the state government had decided that 50 per cent of the plots reserved for the poor in residential colonies would be given to the Haryana Housing Board for Rs 500 per yard, where the board would construct flats for those living below the poverty line. Kanda said the town would be developed into a clean town, which would serve as a model for others. Five undergraduate courses have been allotted to the study centre.As many as 45 Jail inmates were enrolled so far. It was felt that opening of the centre and the library would provide an opportunity to the inmates to carry on their academic pursuits as the concept was interlinked to empowering them and enhancing their moral and intellectual fibre as well as to capacitate them to be “effectively” aware of their fundamental rights and duties. Justice Mittal also handed over para-legal identity cards to 50 inmates who were given six months training in para-legal studies.